Kelly met with two representatives from the company, but says he did not know they would be there. 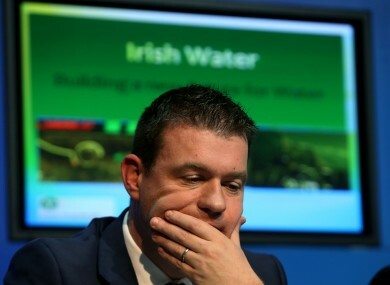 ENVIRONMENT MINISTER ALAN Kelly asked department officials to change the tendering process which was won by a company which he held a meeting with, says Fianna Fáil environment spokesperson Barry Cowen. Last week, AAA TD Paul Murphy said in the Dáil that Kelly had met with two representatives of Task Limited, which won 60% of a state tender for alarms run through Pobal, a state agency under Kelly’s auspices. The Department of Environment says that while Kelly did meet with two representatives of the company, he did not know they would be there when he was asked to meet with his Labour colleague Brendan Ryan. They say that Pobal handled the tender. The Department engaged Pobal to manage the Seniors Alert Scheme and a Service Level Agreement was signed in 2014. As part of this agreement Pobal undertook a national tender for the supply and installation of personal monitored alarms. Any decisions regarding the management of the tender process was a matter for Pobal. Today, Cowen said that the meeting should have ruled the bid out of order. He also says that Kelly later made representations to his department about the process. “FOI requests show that the Minister followed up on his meeting with Task, by making requests about the structure of the tendering process to officials within his department. It is very suspicious that the minister met with Task, the final winner of 60% of the contracts, in the middle of the tendering process. It is even more suspicious that there were no minutes taken of what discussions were had during the meetings, as is normal Departmental practice. A Department of Environment spokesperson said that they had already answered questions on the issue, reiterating that Kelly knew nothing of who would be at the meeting. “A meeting between the Minister and Deputy Brendan Ryan, which was requested by the deputy, was scheduled for 10 December 2014, to discuss the Senior Alerts Scheme. The meeting request from Deputy Ryan did not state that any other people would be attending the meeting; however, Deputy Ryan was accompanied by two people, Mr Bunting, Chief Executive of Task, and Ms Bernadette Dunne, also of Task. The Minister did not have prior knowledge of who would be in attendance. Additional reporting by Dan MacGuill. Deputy Murphy’s comments were made under parliamentary privilege. Comments for this article are closed. Email “Alan Kelly told to 'come clean' about meeting with company which won €3.6m State contracts”. Feedback on “Alan Kelly told to 'come clean' about meeting with company which won €3.6m State contracts”.